Today the Church celebrates the Solemnity of the Body and Blood of Christ. Our Church is built upon this presence of Christ in the Eucharist. We renew again our faith in this mysterious but true presence of Christ in the Eucharistic elements of bread and wine which become His Body and Blood. It is this presence of Christ in the Church and all its members that make the Church at once both Divine and human. 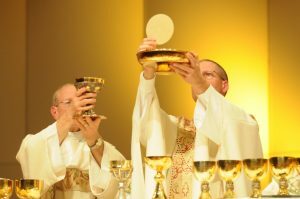 For us as the individual members as well as the corporate Body of Christ, the Church, to be all we are called to be, (holy) it is imperative that we celebrate well and receive regularly the Eucharist. 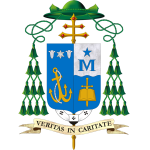 I believe as the English-speaking communities of the Catholic Church prepare to implement the new translations of the Roman Missal, there is a tremendous moment of grace that awaits us. Granted, there will be a challenge as we all get used to these newly translated prayers, but the grace of the moment is that in speaking and listening to the same prayers through a new translation, we have an opportunity for renewed and perhaps a deeper understanding and appreciation for the Truth which they express. As a general rule of thumb, the human experience is generally resistant to change. Let’s keep open hearts and open minds as we approach the significant moment in the history of the Church. This renewed and deeper appreciation for the Real Presence of Jesus Christ in the Eucharist is significant not only for the moment of celebrating Eucharist, but also for the great impact it is meant to have in transforming and redeeming individuals and the world in which we live. We are sent forth from every Eucharist “to love and serve the Lord and one another.” The Eucharist (and the Church) is Christ’s chosen means of “remaining with us until the end of time.” As we receive Christ into our bodies, He is continuing the work of redemption; conforming us more and more to His Truth; transforming our priorities to the priorities of the Kingdom. We are to carry this same presence and person of Christ with us into the world, and be authentic witnesses to the reality of His death and resurrection and His promise to come again. This is the process by which the world is conformed, transformed, converted into the Kingdom of God which has yet to come in all its fullness. How do I allow this presence of Christ in me “speak” in moments of trial and temptation? How do I bring this presence of Christ in me to others? As Christ poured Himself out for our sake, so are we to give fully of our self to others. To do so is to empty oneself, and this gift of self (which is the gift of Christ to others) can only be “refilled” by renewing His life within us at the Eucharistic Feast. Thus, we see the unending cycle of life in our Christian daily life; dying to self, rising in Christ that the work and will of the Father might be fulfilled. This is our belief, that through the ordinary events of our daily life, the extraordinary work of Christ continues until the end of time, when He will return to make all things one and new.